I dashed to the pantry and started poking around. In every package I opened, I found tiny white cobwebs in most bags. They looked like they were pulsating. Then I found the infestation’s ground zero: a box of crackers that was teeming with little white worms. 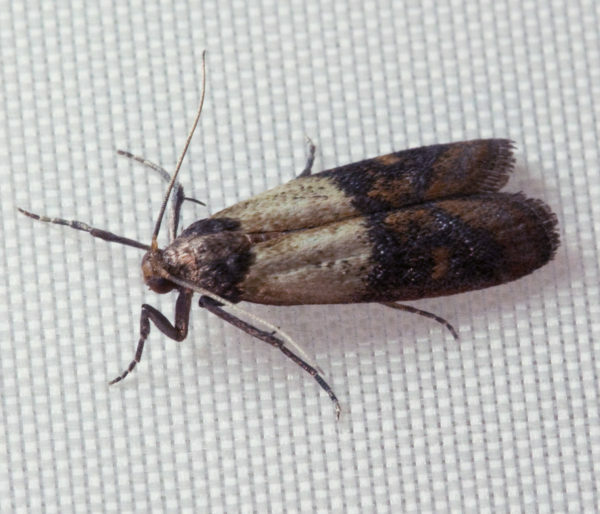 They had spread to every package of nuts, dried fruits, lentils, and pasta, chewing through plastic and even laying eggs in the little holes on the side of the cabinet and between the fibers of the agglomerated wood shelves. Ewwwww! Those little devils are less than half an inch long and they hide their eggs everywhere. It took me days to get everything cleaned up completely. I kept on finding more eggs and larvae, including behind the labels of canned foods… Worse, it cost me hundreds of dollars to replace the food I had to toss. And also the shelves that had eggs in them. Ouch! Pests aside, there are lots of reason to be careful with how you store your food in the kitchen. The vitamin content of foods degrades over time, nuts, oils become rancid, dried fruit hardens beyond recovery, flours spill and make messes, and so forth. Make sure to follow these simple tricks to keep your food inventory safe and tasty until you can use it (hopefully soon). 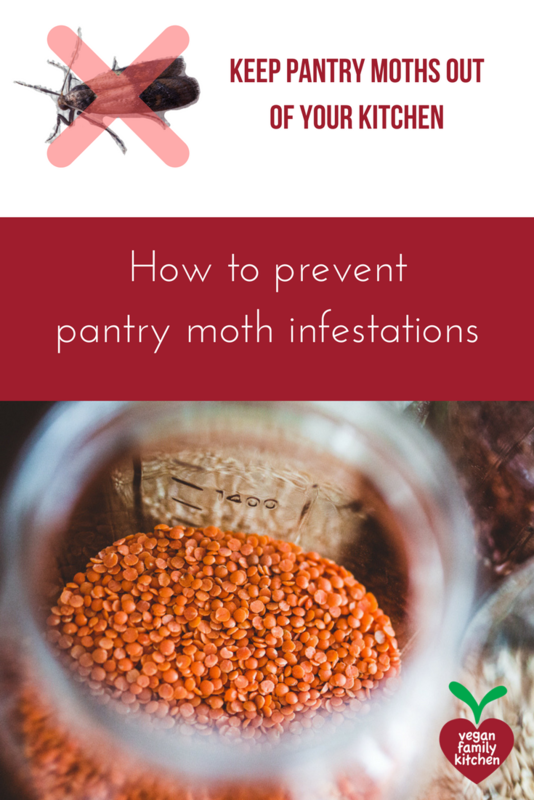 If you follow these steps religiously, you will prevent pantry moths from making your kitchen home. The kit includes inventory templates and a quick-meal cheat sheet. If you can’t see it, you probably won’t eat it (except chocolate chips, which can’t possibly be hidden deep enough). That’s why the spices in the middle of your lazy susan and the condiments on the back of the fridge’s bottom shelf never get used. Consider using risers to store your spices (or one of those cool drawer storage units, if you have extra drawers). Plastic baskets can be used on the upper shelves so you can bring down the whole basket when you are looking for something. You can use the out-of-reach spaces to store extra stocks of frequently-used items, like your favorite flours or rice or nuts. That way, you will pulling a stool to look there at least once or twice a month, so you can keep track of what you have. It seems silly when you are just returning from the store, but I guarantee that two weeks after bringing them home you won’t remember which bulk bag contains the oat flour and which one has spelt. Food in the freezer also becomes hard to identify when your containers get a bit frosty. Recognizing what you find increases the chances that you’ll eat it. Keep a couple of fresh Sharpie markers at hand and a roll of kitchen labels handy. Jot down the description of the item and the date. I like using the digital format YYYYMMDD but use whatever works for you, as long as it’s always the same. Chances are: your food inventory is more valuable than your appliances. Transitioning your pantry to a set of air-tight containers, whether they are glass or plastic tubs, will save you a lot of money over time by preventing messes, spoilage and pest infestations, but it can be costly up front. My solution of choice has been an assortment Mason jars. I get many of them for free from friends, neighbors, yard sales and Craigslist, and I did buy a few at summer-time sale price. I started with the flours, then nuts and dried fruits, and eventually beans. 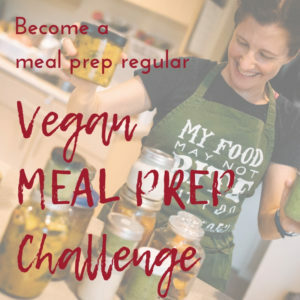 I refill them mostly from bulk products that I bring home using reusable cotton bags, but even if you are using the store’s little plastic bags you will end up with less waste than if you buy pre-packed ingredients. For spices, I use a combination of jars I bought after the dreadful pantry moth episode above (from the American chain Penzeys) and dollar-store jars. A few of my local ethnic grocery stores sell spices in bulk. Aside from protecting my precious food, the assorted clear containers make is easier to identify and inspect what’s inside from any angle (although I always label the top just in case). It’s also easier to keep food neatly stacked, compared to a jumble of rolled-up bags and cardboard boxes. Do keep in mind that your ingredients should be stored away from direct sunlight and heat sources. Buying a large format is often not worth it when you consider the cost of the space required to store it. 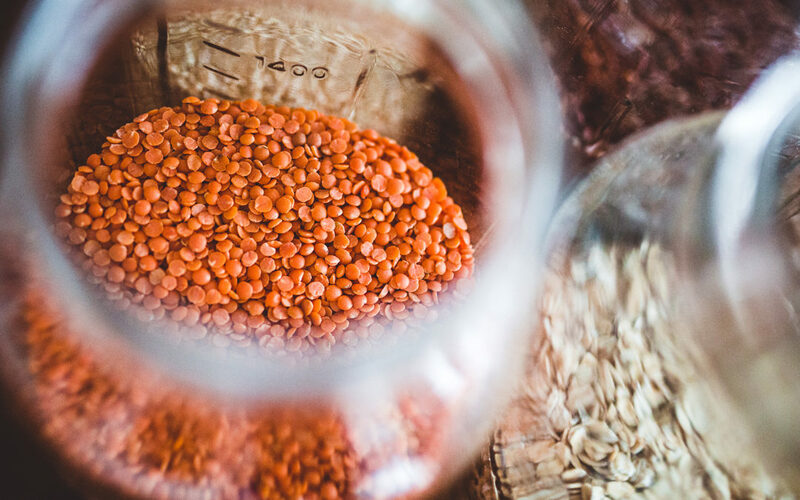 Unless you have a large pantry – and excellent inventory-control habits – I recommend you store no more than a month’s worth of commonly-used items like rice, pasta, flour and so forth. When buying an item for the first time, never be tempted to buy a large format, even if it seems cheaper. The cost of dealing with it once it’s in your home, if you never use it again, is more than the savings on buying that club-sized bag of nutritional yeast if you aren’t even sure you’ll like the stuff. Take a complete inventory of everything you have in the kitchen every season if possible, or at the very least once per year. Toss what’s spoiled and bring feature ingredients to the front. If you don’t feel like you have the time for this, make up for it by eating committing to eat those slightly-older-but-still-serviceable frozen meals in the next couple of weeks. 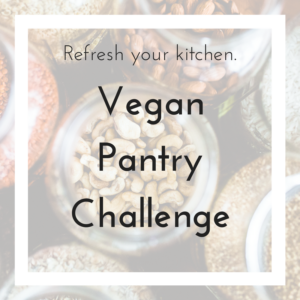 If you haven’t taken stock of everything you have in the kitchen in a while, maybe it’s time for a pantry challenge? The kit includes a quick-meal cheat sheet, inventory templates for your pantry, fridge and freezer, and even warning signs for your family! 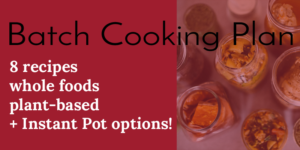 You will also receive my weekly dispatches with strategies and stories from the Vegan Family Kitchen. Unsubscribe anytime.